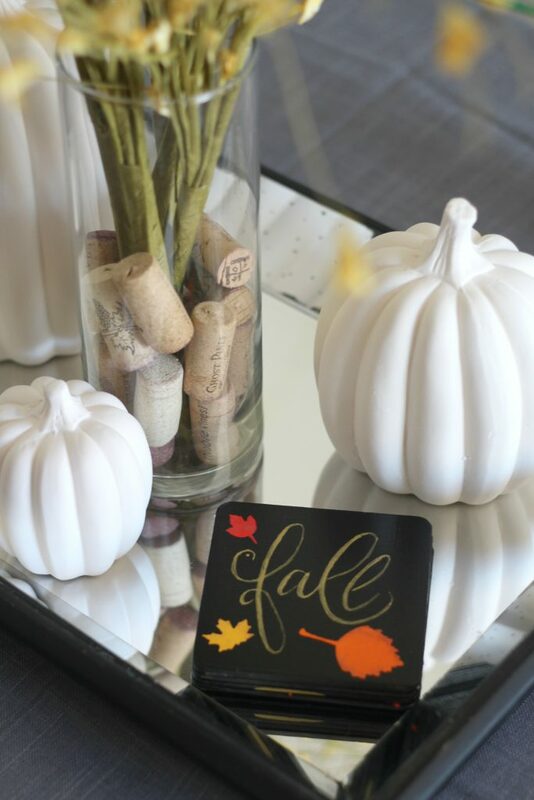 Using paint and die cut leaves, these brushlettered fall leaf coasters turned out stunning and are perfect for classy fall decor! Fall is by far my favorite season with the warm colors, pumpkin spice everything and the cooler temperatures. Well, I can pretend it’s cooler outside. Fall doesn’t really hit Arizona until early November, but a girl can dream! Just because it’s still 108 degrees out doesn’t mean that I can’t start decorating. I decided to start will a little craft to kick off the season. 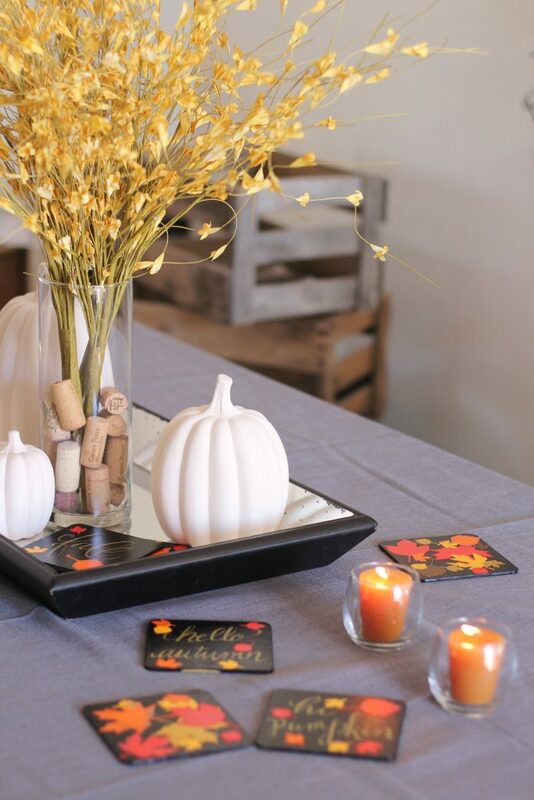 I love fall leaves and love crafting and decorating with them. I’ve made a stenciled table runner, a wreath, placemats from way back in the day… I could go on. But I really love these coasters! 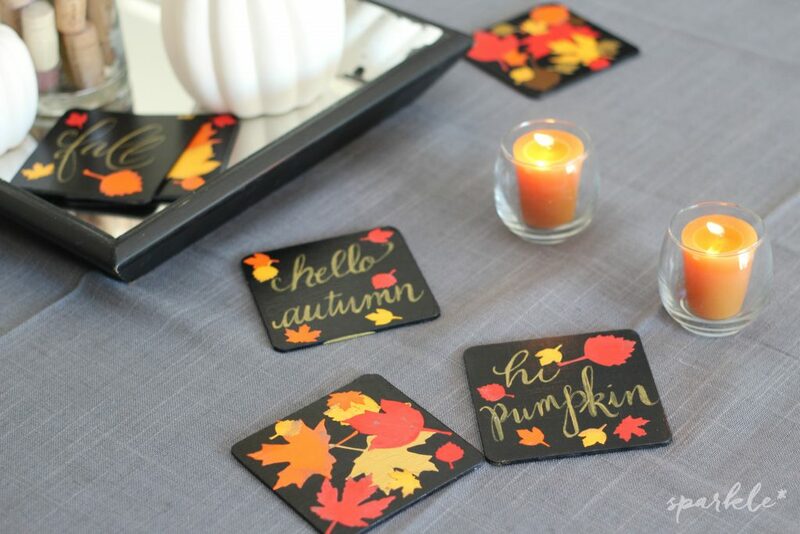 These coasters are colorful and sweet and perfect for setting your Pumpkin Spice Latte on! 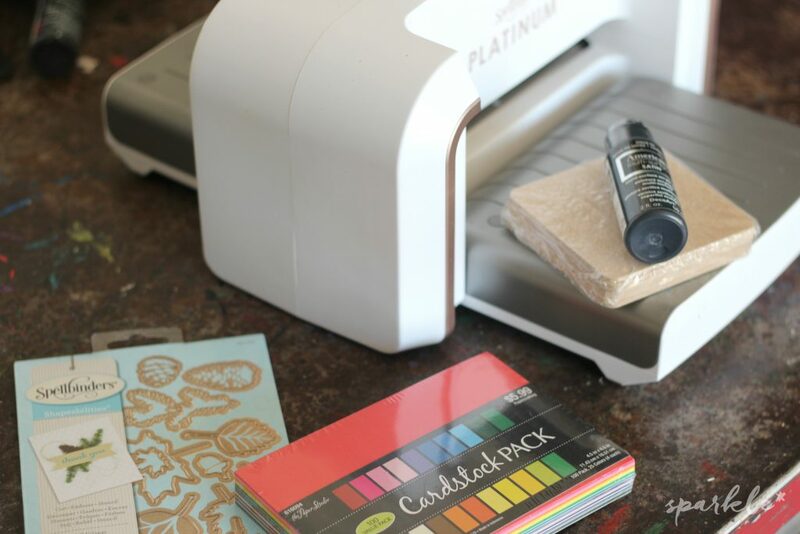 Paint the fronts and backs of the coasters with the Black Tie paint using a foam brush. Don’t forget the sides! Let dry. Cut leaf shapes out of fall colored cardstock and the gold vinyl using the Fall Foilage Dies and your die cutting machine. Ink the edges of the cut out leaves with the ink pad in Vintage Photo. 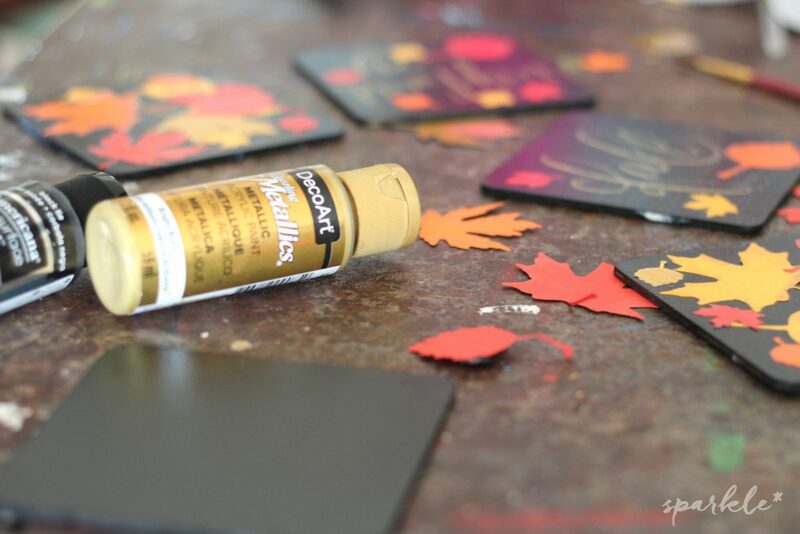 Using the ModPodge, glue the leaves haphazardly to three of the painted black coasters, add some gold vinyl leaves. Apply three coats of the ModPodge to the coasters, letting dry between each coat. For the brushlettered words, I wrote the words out in pencil, very lightly, on the black coasters. Using just the tip of my brush and the Bright Brass paint, I traced my pencil marks, using pressure on the downstrokes and very lightly on the upstrokes. Once the words were dry, I went over again to get good paint coverage. Then add a few die cut leaves and a few layers of ModPodge to seal. 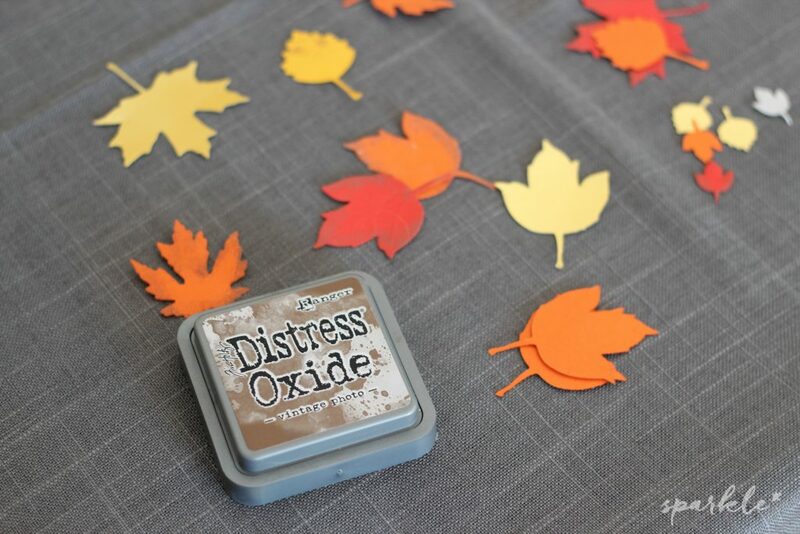 Let the ModPodge cure for a day or two before putting a wet cup on the brushlettered fall leaf coasters. These are really pretty! Pinning to try this! Very cute and practical! Visiting from Home Matters party. 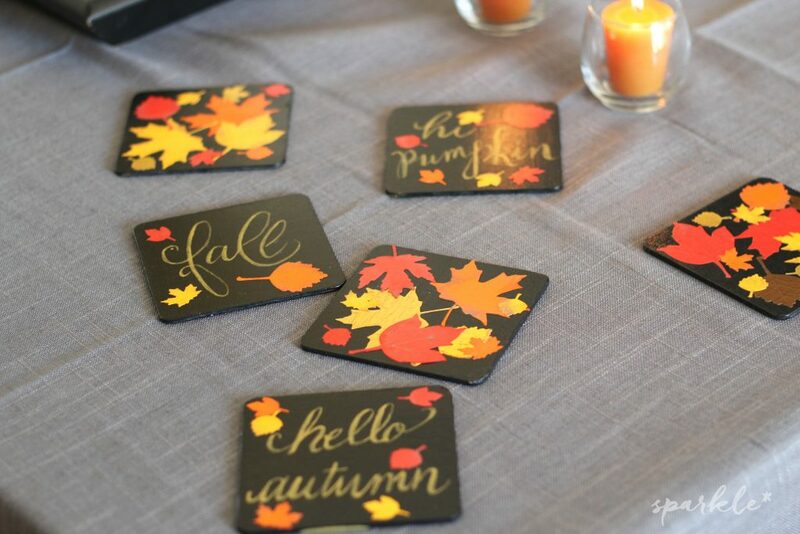 Your fall leaf coasters are lovely. Thanks for sharing with us at Snickerdoodle. We’ll be featuring this at today’s party. Hope to see you there! Fall is my favorite season, and I just love these! Thanks for sharing on To Grandma’s House We Go! So colorful and fun! Thanks for sharing how to make them with SYC.